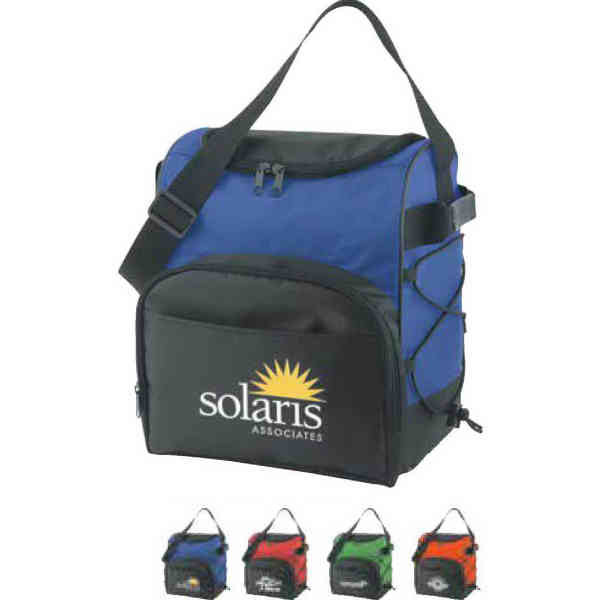 Help recipients to stay calm, cool and collected about their business with your brand when you advertise on this travel cooler! Made of 420 denier material, it measures 10 1/4" x 12 1/4" x 8 3/4" and is offered in multiple product colors. It features a dual-zippered main compartment, zippered front pocket, front slit pocket, black piping accents, adjustable shoulder strap, padded side handles and an elastic rope to hold a beverage. This product holds up to 16 cans. Your brand is sure to make its rounds this summer when added to such a useful promo tool! Size: 10 1/4 " x 12 1/4 " x 8 3/4 "